French jewelry design company, and Romain Herzo, which was founded by Eric Herzo Jaghaspanian, has released two new female models Kristina and Victoria. Their new brand will present a one-hour show from 5 to 9 September, and from 21 to 25 September – jewelery exhibition in Hong Kong. Model Kristina, made in a minimalist style, is a true masterpiece of jewelry. Interestingly its design: the edge of the body and the middle of the dial decorated with diamonds, which total – 61, total 1 ct. New housing is made of palladium-coated gold, and white dial decorated with the logo mark and the two arrows. Instead, some tags are inserted diamonds. Model comes from the alligator strap. Another model, named Victoria, made of white gold and the dial is also decorated with diamonds. 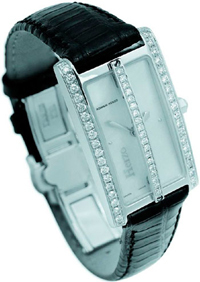 Models of the French brand Romain Herzo combine traditional methods of watchmaking and modern technology.